Objective: To evaluate efficacy and safety of intravitreal bevacizumab (Avastin) in eyes with macular oedema secondary to central retinal vein occlusion (CRVO) or branch retinal vein occlusion (BRVO). Methods: Twenty-eight consecutive patients (28 patients, 29 eyes, 8 CRVO, 21 BRVO) were enrolled in the study. Three intravitreal injections of 1 mg bevacizumab (0.04 ml) were administered at 4-week intervals; further retreatment was based on optical coherence tomography (OCT) findings. Follow-up examinations were done at days 1, 7 and 28 and at monthly intervals thereafter. Results: Mean baseline central retinal thickness (CRT) in OCT was 558 µm (range 353–928 µm) and mean BCVA was 20/100. One day after the first injection, CRT significantly decreased to 401 μm (p<0.01). Three injections reduced macular oedema to 328 μm CRT (p<0.01) and improved BCVA to 20/50 (p<0.01). At 6 months, CRT was 382 μm (p<0.01), and BCVA was stable at 20/50−2 (p<0.01), FA showed no evidence of increased avascular zones. Conclusion: Intravitreal injections of bevacizumab appear to be a safe and effective therapy in the treatment of macular oedema secondary to retinal vein occlusion. A very common finding of retinal vein occlusions is a chronic macular oedema, which is in part responsible for severe visual impairment. Several therapeutic options are currently in clinical use. The Branch Vein Occlusion Study1 recommended a grid pattern lasercoagulation for selected branch retinal vein occlusion (BRVO). However, this treatment strategy is not recommended for central retinal vein occlusion (CRVO).2 Intravitreal injections of corticosteroids have been increasingly used,3–5 but the treatment success is limited by ocular complications.4–9 Several surgical techniques10–12 are still controversial and have not yet been sufficiently supported by randomised clinical trials. With the introduction of anti-vascular endothelial growth factor (VEGF) therapy for the treatment of ocular diseases, several anti-VEGF drugs appear promising for CRVO/BRVO. Since retinal vein occlusions are associated with increased levels of VEGF in the vitreous,13 14 and VEGF has been shown to play a major role in the development of macular oedema,13 the inhibition of VEGF could be of therapeutic value. Our prospective study evaluated the effect of intravitreal bevacizumab on macular oedema secondary to retinal vein occlusion. This prospective, uncontrolled study was conducted at the Department of Ophthalmology at the Medical University of Vienna and enrolled 28 consecutive patients (29 eyes). The change in mean best corrected visual acuity (BCVA) was defined as the primary study outcome. 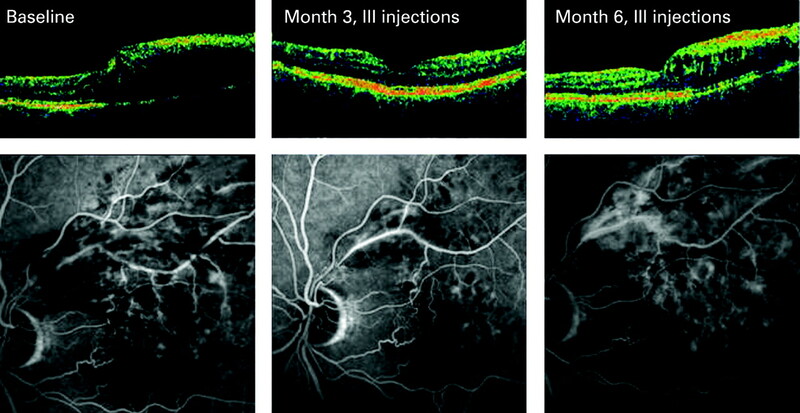 Secondary outcomes were change in the 1-mm central retinal thickness (CRT) as measured by optical coherence tomography (Stratus OCT™, Carl Zeiss Meditec AG, Jena, Germany), number of treatments, ocular and systemic safety, progression of avascular areas by fluorescein angiography (FA) and the incidence of neovascular complications. For study inclusion, BCVA measured by Early Treatment Diabetic Retinopathy Study (ETDRS) charts at 2 m distance21 had to be between 20/800 and 20/25. Patients with BRVO and a BCVA of 20/50 or worse had either prior grid laser coagulation or were offered grid laser coagulation. Out of the patient population presenting with BRVO, four patients had laser coagulation prior to study inclusion. None of the BRVO patients suitable for grid laser coagulation agreed to such treatment after full informed consent. CRVO patients had no laser treatment prior to study inclusion. The CRT as measured by OCT had to exceed 250 μm due to cystoid macular oedema involving the foveal centre. Exclusion criteria were signs of non-perfusion or ischaemia, defined as neovascularisation on the disc or elsewhere, rubeosis or more than 10 disc areas of non-perfusion detected by FA (Heidelberg Retina Angiograph II, Heidelberg Engineering, Heidelberg, Germany). Each angiogram was interpreted by the authors SM and MG. To await spontaneous improvement and to exclude a potentially negative effect of anti-VEGF therapy on formation of collaterals, the duration of the RVO had to be longer than 3 months before treatment initiation. Follow-up examinations were performed 1 day, 1 week and 1 month after the first injection and in monthly intervals thereafter. Each patient underwent a baseline screening including BCVA, measurement of CRT, FA, and slit-lamp biomicroscopy. Repeated OCT, BCVA testing and slit-lamp examination was performed at each study visit. FA was performed at 3-month intervals. Each patient received three initial intravitreal injections of 1 mg of bevacizumab (0.04 ml) at 4-week intervals. Injections were performed under sterile conditions in the operating room according to the national recommendations.22 Bevacizumab was prepared under sterile conditions by the University Hospital pharmacy and filled into sterile tuberculin syringes, each containing 0.2 ml (5 mg). A volume of 0.04 ml of bevacizumab was injected via the pars plana into the vitreous using a 30 g needle. After three initial injections, re-treatment was indicated whenever persistent or recurrent intraretinal oedema was documented by OCT. No repeated injection was indicated in case of progression of avascular areas by more than three disc areas. Changes in BCVA and CRT are presented as mean (and range). BCVA is reported in letters read on ETDRS charts and their Snellen equivalent. The paired t test was applied for data with normal distribution. A value of p<0.05 was considered as statistically significant. For correlations, the Pearson test was used and specified by coefficient “r” and by “p” for significance. Fifteen female and 13 male participants were enrolled in the study (mean age: 66 years). One patient presented with BRVO in both eyes. Eight eyes presented with CRVO, 21 eyes with BRVO. Two patients were excluded at month 3 due to reasons unrelated to their ocular disease. During the 6-month follow-up period, each patient received a mean of 5.3 out of seven possible injections. All patients received three consecutive initial injections and a mean of 2.3 injections between months 2 and 6 based on OCT findings. Baseline mean BCVA was 50 ETDRS letters (20/100) ranging from 3 to 78 letters (20/800 to 20/26−2). Within 1 day following the first injection, BCVA improved by five letters (one line/p<0.01). At months 1 and 3, BCVA improved further to 60 letters (20/63) (p<0.01) and 63 letters (20/50−2) (p<0.01) respectively. Up to month 6, there was, compared with baseline, a mean improvement of 15 letters (three lines) to 65 letters (20/50) (p<0.01). Figures 1, 2 (left graph) illustrate the change in mean BCVA over time up to month 6. Figure 1 Mean change in BCVA and CRT from baseline to month 6. *Follow-up visits at with significant improvement in BCVA and significant reduction in CRT as compared with baseline values. Error bars represent mean and 95% confidence intervals. Figure 2 Left graph: Scatter plot of BCVA results at baseline (y-axis) compared with results after 6 months (x-axis). Circles represent individual outcomes. Circles above the 45° regression line indicate patients with decreased BCVA after 6 months. Circles beneath the line represent patients who did have vision improvement. Right graph: Scatter plot of CRT results at baseline (y-axis) compared with results at month 6 (x-axis). Circles above the 45° regression line represent patients showing decreased CRT. Circles beneath the line indicate patients with increased CRT despite treatment at months 6. Mean CRT at baseline was 558 μm (range: 353–928 μm). CRT measurements 1 day, 1 week and 1 month after the first injection demonstrated a highly significant (p<0.01) reduction in mean CRT to 401 μm, 323 μm and 331 μm, respectively. At month 3, 1 month after the last of three initial injections, CRT remained stable at 328 μm (range: 180–625 μm). The OCT based retreatment regimen between month 3 and 6 led to a slight, but not significant, increase in mean CRT to 382 μm (range: 185–808 μm) at month 6. Compared with baseline, the CRT at month 6 was still significantly (p<0.01) reduced by a mean of 172 μm (range: −579 to +111 μm). Figures 1, 2 (right-hand graph) summarise the change in CRT over time. There was a statistically significant correlation of improvement in BCVA and decrease in CRT (r = −0.49, p = 0.02). An analysis to reveal predictive factors for outcome found no significant correlation between the duration of RVO and improvement of BCVA (r = −0.34; p = 0.11) or the decrease in CRT (r = 0.33; p = 0.12). Furthermore, neither the patient’s age (r = 0.07, p = 0.73), nor baseline BCVA (r = −0.37, p = 0.07) nor baseline CRT (r = 0.17, p = 0.41) appeared to have any predictive effect on BCVA outcome within the collective sample (BRVO and CRVO). Within 6 months, none of the patients showed any severe local adverse events such as uveitis, retinal detachment or endophthalmitis. None showed progression to ischaemic BRVO/CRVO documented clinically as well as by FA imaging, and no systemic complications such as thrombo-embolic events occurred. 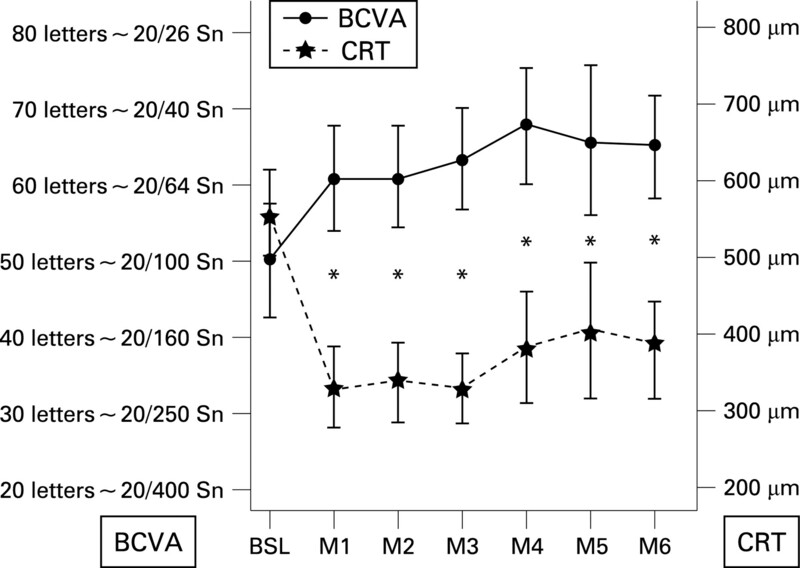 The mean BCVA in the CRVO group (n = 8) was 35 letters (20/200) at baseline, and 47 letters (20/125+2) at month 6. The improvement in vision was not statistically significant (p>0.05). Similarly, the reduction in mean CRT from 585 μm at baseline to 489 μm at month 6 was not statistically significant (p>0.05). According to the study protocol, a mean number of 4.8 out of seven possible injections per patient were administered. For this subgroup, analyses with regard to possible predictive factors revealed no correlation of BCVA outcome and age, baseline BCVA, baseline CRT, or duration of thrombosis. An angiographic example for CRVO treated with repeated 1 mg bevacizumab injections is shown in figure 3. Figure 3 Patient presenting CRVO in the left eye. This patient showed an excellent response to four injections of bevacizumab within 6 months. Consent has been given for publication of this figure. The subgroup of eyes with BRVO (n = 21) showed a statistically significant (p<0.001) improvement in BCVA from a mean of 55 letters (20/80) to 70 letters (20/40) at month 6. Consistent with the recovery of retinal function, the mean CRT decreased significantly (p<0.001) from 547 μm at baseline to 349 μm at month 6. The restoration of retinal anatomy (CRT), as a decrease in CRT, and the improvement of vision correlated significantly (r = −0.59; p = 0.01). In this subgroup, 5.5 out of 7 possible injections were required. Data analyses with respect to possible predictive factors identified the time interval between onset of thrombosis and therapy initiation correlating significantly (r = −0.49, p = 0.03) with an improvement of vision. However, the level of decrease in CRT did not correlate significantly with this time interval (r = 0.22; p = 0.37). Further analyses revealed that individuals with a low BCVA at baseline achieved a higher benefit by the treatment than patients, which presented a higher BCVA at baseline (r = −0.54; p = 0.01). Baseline CRT had no significant impact on VA improvement (r = 0.38; p = 0.10). Figure 4 shows a case of BRVO responding favourably to intravitreal bevacizumab therapy as documented by angiography and OCT. Figure 4 Patient presenting with BRVO. After three intravitreal injections of bevacizumab, further treatment was abandoned until the month 6 study visit, when oedema recurred. Consent has been given for publication of this figure. Interestingly, subgroup analysis with regard to a significant improvement in VA and/or reduction in CRT due to the treatment with Bevacizumab showed no significant benefit for patients with CRVO. These results may be due to a relatively small number of patients in this subgroup, but this observation might also indicate that a larger amount of anti-VEGF antibodies is needed to obtain therapeutic results as seen in patients with BRVO. In this context, it can be speculated that CRVO with larger areas of hypoperfusion leads to higher levels of VEGF expression,13 14 29 requiring an adjusted anti-VEGF dosage. The findings of our study with regard to CRVO are clearly limited due to the small CRVO subgroup. However, the findings in this group are potentially valuable indicators for new prospective studies on anti-VEGF drugs in CRVO in the near future. Despite early results being promising, some questions remain unanswered. First of all, anti-VEGF therapy for RVO clearly represents a symptomatic treatment. Long-term follow-up is needed to show maintenance of beneficial effects obtained by local therapy. Our 6 months results indicate that compared with neovascular AMD, more frequent retreatment will be necessary to achieve satisfactory therapeutic effects. The study further implicated that not all patients respond equally well to intravitreal bevacizumab therapy. Statistical analyses were done to evaluate potential predictive factors for VA benefit. For patients presenting with CRVO, we could not identify any association with age, onset of thrombosis and therapy initiation, baseline VA or baseline CRT. However, due to the small study sample, further investigation is obviously needed to provide comprehensive information. In the BRVO subpopulation, we found that patients with a rather low visual function at baseline showed more treatment benefit than individuals with less compromised initial BCVA. Initial BCVA correlated well with initial CRT, and the improvement of vision correlated significantly with the decrease in CRT. In addition, we found that a shorter disease duration was positively correlated with more vision improvement. Patients with a long-lasting pathology frequently showed good anatomical results but did not gain vision; in contrast, patients who received treatment soon after the onset of the oedema presented with good anatomic and vision outcomes. These associations suggest that a long-lasting pathology has led to irreversible retinal damage, which cannot be restored merely by resolution of retinal oedema. Levels of a variety of other angiogenic and inflammatory factors in the retina and/or vitreous are likely to be of importance. Detailed evaluation for possible long-term adverse events of anti-VEGF agents is essential, even if previous studies showed no evidence of any toxicity of bevacizumab in the dosage used for ophthalmological purposes.24 30–32 Since currently used therapies for retinal vein occlusions have achieved only limited success and implicate complications, anti-VEGF therapy obviously seems to be a novel, innovative approach, which should be further evaluated in large, prospective, controlled clinical studies. The Branch Vein Occlusion Study Group. Argon laser photocoagulation for macular oedema in branch vein occlusion. Am J Ophthalmol 1984;98:271–82. The Central Vein Occlusion Study Group M report. 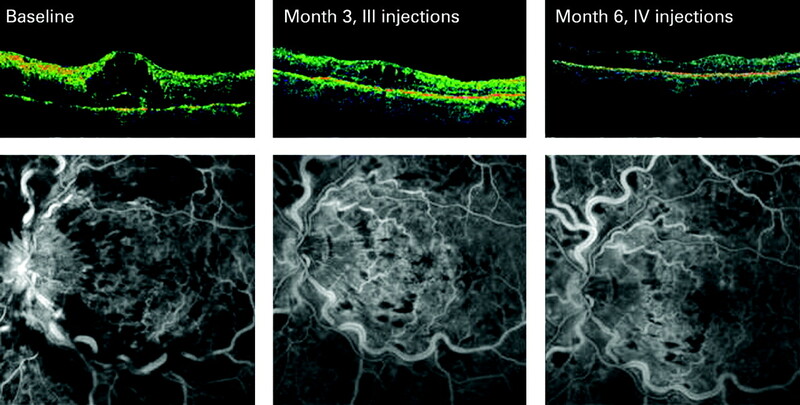 Evaluation of grid pattern photocoagulation for macular oedema in central vein occlusion. Ophthalmology 1995;102:1425–33.
. Intravitreal triamcinolone for the management of macular edema due to nonischemic central retinal vein occlusion. Arch Ophthalmol 2004;122:1137–40.
. Prognostic factors for visual acuity improvement after intravitreal triamcinolone injection. Eye 2006;21:1067–70.
. Prospective evaluation of intravitreal triamcinolone acetonide injection in macular edema associated with retinal vascular disorders. Eur J Ophthalmol 2005;15:619–26.
. One-year safety and efficacy of intravitreal triamcinolone acetonide for the management of macular edema secondary to central retinal vein occlusion. Retina 2006;26:889–95.
. Ocular morbidity associated with intravitreal triamcinolone acetonide. Eye 2006;21:317–20.
. Argon laser trabeculoplasty in triamcinolone acetonide induced ocular hypertension refractory to maximal medical treatment. Eur J Ophthalmol 2006;16:756–7.
. Cataract formation and other complications of intravitreal triamcinolone for macular edema. Am J Ophthalmol 2006;141:629–37.
. Role of early radial optic neurotomy in central retinal vein occlusion. Indian J Ophthalmol 2005;53:115–20.
. Surgical treatments of central retinal vein occlusion. Semin Ophthalmol 2003;18:142–6.
. Surgical induction of chorioretinal venous anastomosis in ischaemic central retinal vein occlusion: a non-randomised controlled clinical trial. Br J Ophthalmol 2005;89:64–9.
. Pathogenesis of macular edema with branch retinal vein occlusion and intraocular levels of vascular endothelial growth factor and interleukin-6. Am J Ophthalmol 2005;140:256–61.
. Intravitreal levels of vascular endothelial growth factor and interleukin-6 are correlated with macular edema in branch retinal vein occlusion. Graefes Arch Clin Exp Ophthalmol 2006;244:309–15.
. Intravitreal bevacizumab (Avastin) for central and hemicentral retinal vein occlusions: IBeVO study. Retina 2007;27:141–9.
. Optical coherence tomography findings after an intravitreal injection of bevacizumab (avastin) for macular edema from central retinal vein occlusion. Ophthalmic Surg Lasers Imaging 2005;36:336–9.
. Intravitreal bevacizumab (Avastin) treatment of macular edema in central retinal vein occlusion: a short-term study. Retina 2006;26:279–84.
. Clinical, anatomic, and electrophysiologic evaluation following intravitreal bevacizumab for macular edema in retinal vein occlusion. Am J Ophthalmol 2007;143:601–6.
. Intravitreal bevacizumab (Avastin) in the treatment of macular edema secondary to branch retinal vein occlusion. Retina 2007;27:419–25.
. Bevacizumab for the treatment of macular edema secondary to retinal vein occlusion. Ophthalmologe 2007;104:285–9. Treatment of Age-Related Macular Degeneration with Photodynamic Therapy (TAP) Study Group. Photodynamic therapy of subfoveal choroidal neovascularization in age-related macular degeneration with verteporfin: one-year results of 2 randomized clinical trials—TAP report. Arch Ophthalmol 1999;117:1329–45.
. Recommendation for the implementation of intravitreal injections—statement of the German Retina Society, the German Society of Ophthalmology (DOG) and the German Professional Association of Ophthalmologists (BVA). Klin Monatsbl Augenheilkd 2005;222:390–5.
. Probability of adverse events that have not yet occurred: a statistical reminder. BMJ 1995;311:619–20.
. Safety of intravitreal injection of bevacizumab in rabbit eyes. Retina 2006;26:882–8.
. Intravitreal bevacizumab treatment of choroidal neovascularization secondary to age-related macular degeneration. Retina . 2006;26:383–90.
. Short-term safety and efficacy of intravitreal bevacizumab (Avastin) for neovascular age-related macular degeneration. Retina 2006;26:495–511.
. Systemic bevacizumab (Avastin) therapy for neovascular age-related macular degeneration twelve-week results of an uncontrolled open-label clinical study. Ophthalmology 2005;112:1035–47.
. The International Intravitreal Bevacizumab Safety Survey: using the internet to assess drug safety worldwide. Br J Ophthalmol 2006;90:1344–9.
. Correlation of increased vascular endothelial growth factor with neovascularization and permeability in ischemic central vein occlusion. Arch Ophthalmol 2002;120:1644–50.
. Electrophysiologic and retinal penetration studies following intravitreal injection of bevacizumab (Avastin). Retina 2006;26:262–9.
. Testing intravitreal toxicity of bevacizumab (Avastin). Retina 2006;26:257–61.
. Evaluation of in vitro effects of bevacizumab (Avastin) on retinal pigment epithelial, neurosensory retinal, and microvascular endothelial cells. Retina 2006;26:512–8. Ethics approval: The study was approved by the ethics committee at the Medical University of Vienna, was registered at the European clinical database (EUDRACT-2005-003288-21) and followed the tenets of the Helsinki protocol. Patient consent: Informed consent was obtained from all patients. British Journal of Ophthalmology 2008; 92 443-443 Published Online First: 27 Mar 2008.